Hello! Well, I've crawled back out of my hole after Quilt Con. WHAT A BLAST THAT WAS! It was entirely too fast and too quick, but man it totally tired me out! I was there a total 4 days, and I felt that I didn't even have a chance to take a breath. Two of the days were spent all day teaching classes, and interviews, and book signings and conversing with friends in the passing by. Occasionally I would be able to meet up for dinner with friends and we would talk about how fun everything was. My Classes were amazing. So kind and fun. Our triangle class was first and we learned wonky, flying geese, HST, hour glass, just to name a few. It was fun if I do say so myself. I loved talking and joking and teaching and learning from my students. Such a fun give and take group of individuals. The second day was spent teaching the Ombre gradient class. These ladies knocked out learning tons of techniques using my ombre gradient fabric. WE HAD A FUN TIME. we learned how to piece randomly and how to piece purposely with gradients, how to appliqué, how to pleat, and how to make rosettes jut to name a few. Much thanks to both of my classes it was so much fun getting to know you in our time together. During my classes and interviews and book signings, there was a common comment I got a lot of: "You're a lot shorter in person." and "You are very animated when you talk." This last Sunday after church I brought out my EPP from last year that I started at Camp Stitch A Lot and worked on it for a little. It was a nice little side distraction from all deadlines. 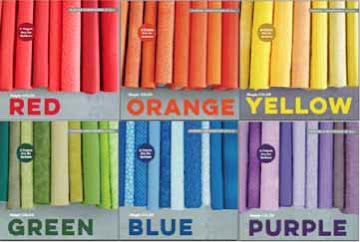 BUT, I did get one step closer to having our two new patterns for Simply Colorful RED, ORANGE, YELLOW ready for release! Now back to reality of deadlines to be met, children to usher to activities, and dirty dishes. Life is a wonderful thing, I love my "crazy normal" and I love being home for a little bit. (HELLO SPRING MARKET COMING IN A COUPLE OF MONTHS!) One thing at a time. It was SO much fun to meet you at Quiltcon. My sister and I were at the Bernina booth to hear you. We wanted to take one of your all day classes but did not get in :-(. Thank you for what you shared at the booth. Those shelves filled with your fabric--GORGEOUS, GORGEOUS, GORGEOUS! And those colorful toes of yours are pretty cute, too! I am so sorry that I could not go to QuiltCon and do appreciate the pictures. The fabric diet that I am presently on is about to be history. 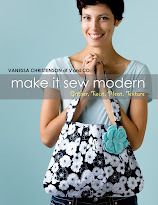 I am loving your new fabrics and can't wait to see the patterns!!! Adore this quilt. Glad you had fun. Wow, you picked my quilt as your favourite, that makes my day. It is called Breathe. 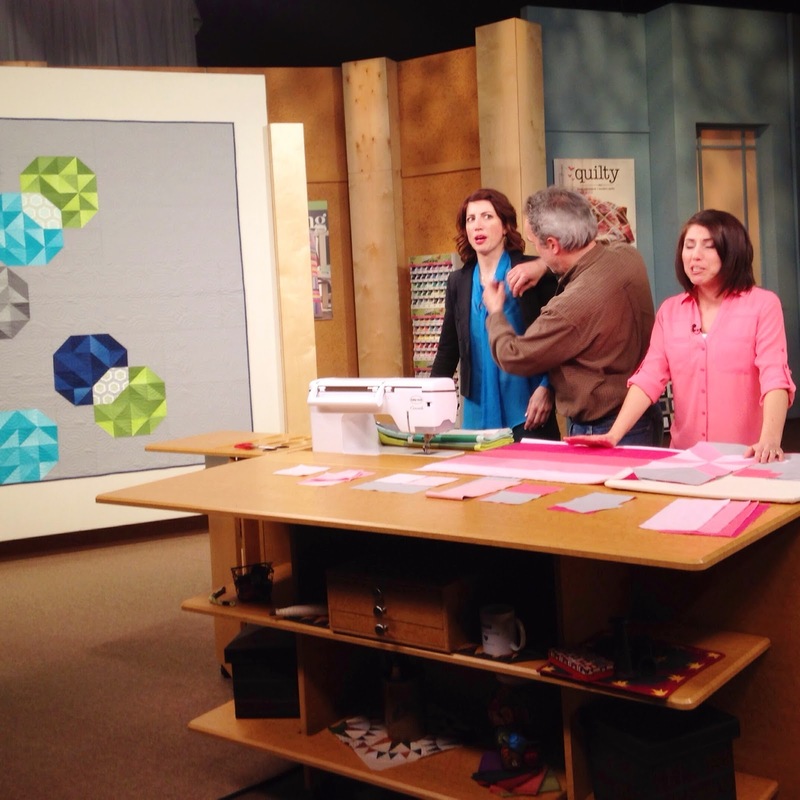 I had a blast at QuiltCon too. Thanks for the great pictures. I love the flailing arms. I am like that too. :) I bought a couple of yards of your ombre fabric, the pink and the green. I haven't yet decided what to make, but I am ready when I figure it out. I am loving your first book. I bought the series as a little gift for myself. A surprise in the mail every month or two. 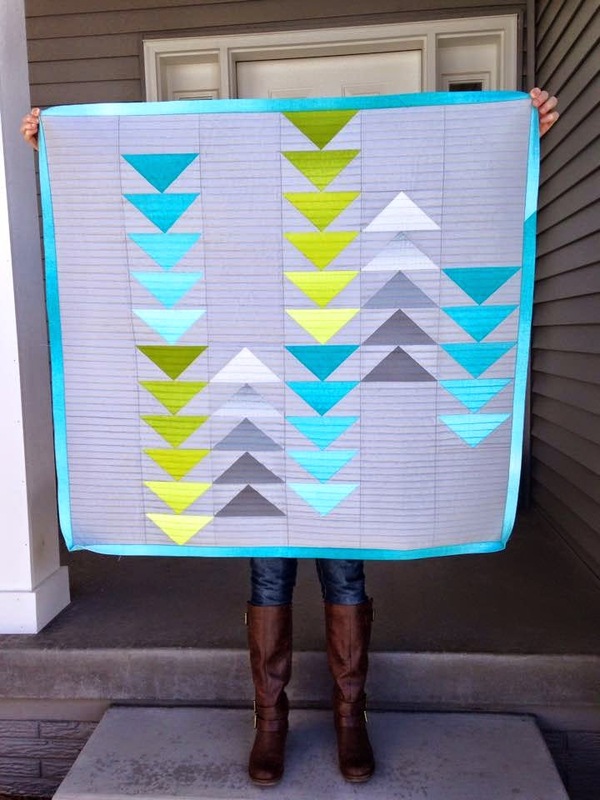 Oh I love the blocks of ombre ~ going to have to go looking for it! Hope you're going to QuiltCon next year ~ I've already got my room booked! I can relate to taking with your hands! I often hand sew while chatting with friends and I always wind up slowing down because I keep putting the needle down to gesture. Love it all, but especially the polka dot dress in your booth! Do you have a pattern?